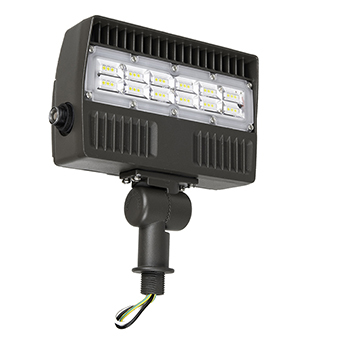 Energetic's E1FLK series is a “go-to” product for lighting autobody yards, perimeter security lighting, or illuminating a loading dock approach. Aluminum die-cast housing easily shed heat via robust radiator fin design. An anti-UV polycarbonate lens is used to provide 95% light transmittance for optical efficiency and durability. Both body and access covers use fully annular gasketing for robust sealing. Standard mounting a BSPP-threaded elbow arm with a 180° adjustable angle. Also, available with or without integrated dusk to dawn photocontrol sensor. Dimensions 7.8"x8.5"x2.3" 7.8"x8.5"x2.3" 7.8"x8.5"x2.3" 7.8"x8.5"x2.3"